The official UK visit of King Felipe VI and Queen Letizia started. 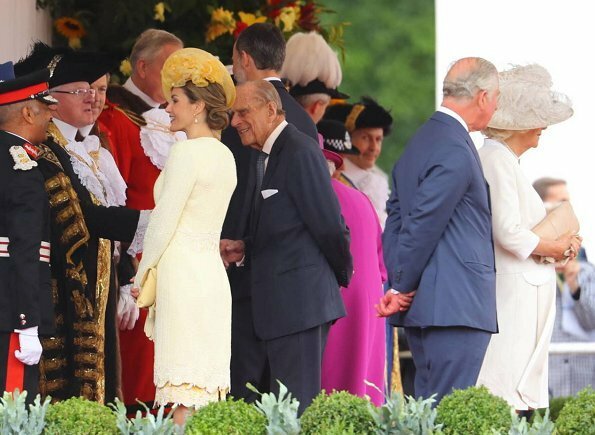 King Felipe VI and Queen Letizia of Spain officially welcomed by Queen Elizabeth II, Prince Philip, Prince Charles and Duchess Camilla in central London, UK on July 12, 2017. According to the programme, the state visit starts on July 12 and ends on July 14, 2017. Letizia is perfectly put together. She really is amazing. Yellow color is not my favorite on her but it's summer and it is one of the colors in the Spanish flag. I am impressed with how well her clothes are fitted. I suppose they are literally made for her and I wonder why certain other royal ladies cannot do the same. Queen Letizia really looks amazing! Letizia looks wonderful! Style, colours, the fit - and best of all, the hat! 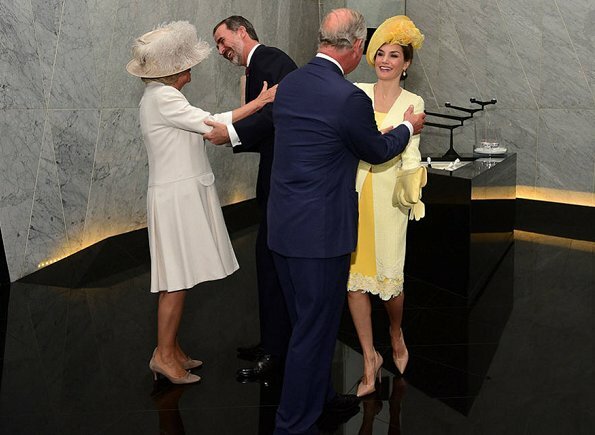 It's a surprise to see Letizia in yellow. But I think she can wear this difficult colour and it is a nice contrast to QEII's purple coat during the welcome ceremony. Letizia looks very elegant and polished, hairstyle and hat are beautiful. I don't like the hemline, a simple one would have been better. But that's what we call in German "Meckern auf hohem Niveau". Agree, without the lace this outfit is a 10, but Varela always insists on these. Letizia looks beautiful, and although this is not precisely her style or the way the spanish royals dress for these occasions, she definitely can carry it. Agree. This isn't the style spanish royals wear. But, as we say in Spain, "en Roma, lo que los romanos" o también, "donde fueres haz lo que vieres". These mean "do what they do where you go". It is a signal of respect. i was looking forward to this state visit.Letizia looks beautiful. this outfit is wonderful for the occasion. yellow not my favourite colour, but i think that she really looks good in it. and the hat is lovely. well rounded outfit by the queen of spain. and her majesty the queen of England looks awesome. and let me not forget.... the king of Spain looks handsome indeed! I was excited also. Agree fully with your comment. Beautiful couple, he looks handsome and she is a knocked out. 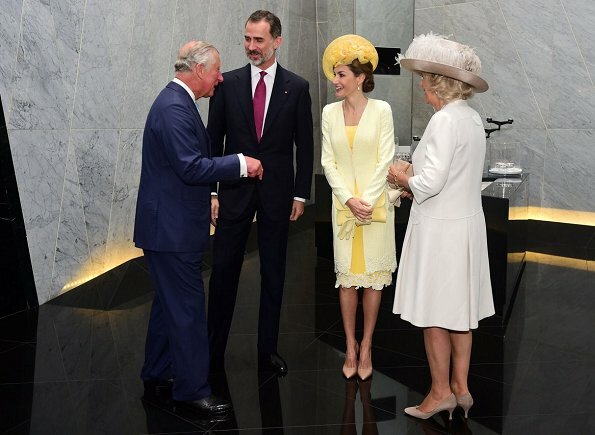 She looks amazing , even with yellow she looks gorgeous and plus she can wear hat and still looks amazing too bad the Spanish royals don't wear them as often as others. I can't wait to see the tiara tonight!! Neither can I. Hoping for one of the big whoppers. 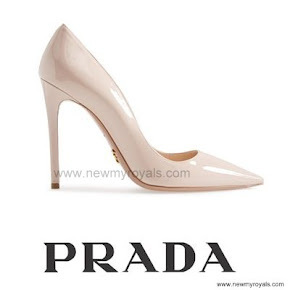 Letizia always looks comfortable and confident it what she wears, and shows. The yellow is simply stunning ! If this was today's treat, can only imagine what she has lined up for tonight's state dinner ! 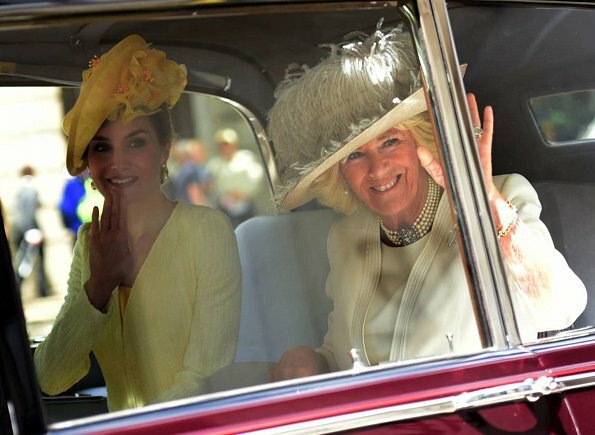 Looking fabulous - the soft yellow is lovely on her and she looks absolutely wonderful in that hat. I know it's not her usual style but it's a shame she doesn't wear hats more often because they really suit her. 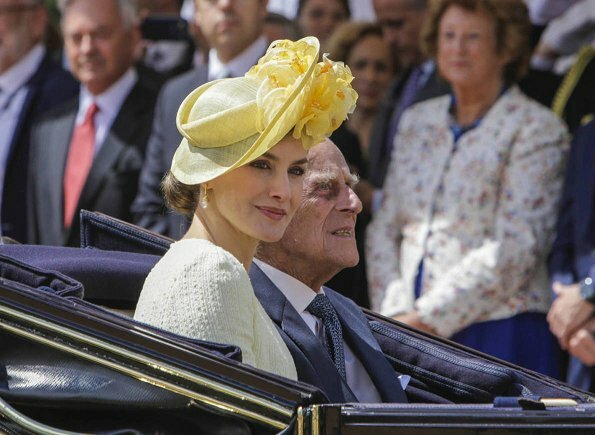 La reina Letizia ha sido hoy un brillante rayo de sol español en Londres. Bellísima, elegante y en muy buena sintonía con los miembros de la BRF. 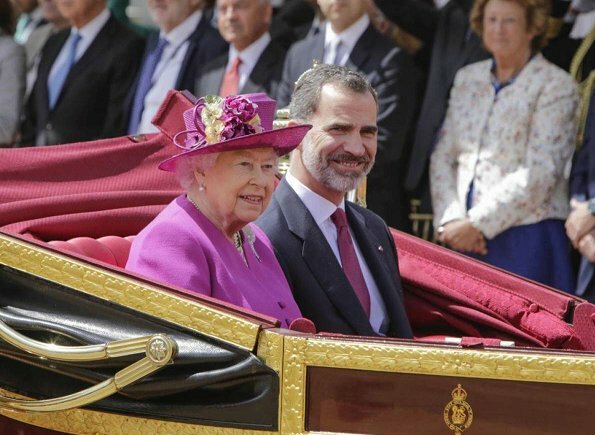 El rey Felipe es un alto, guapo y encantador caballero. Pareja perfecta. One of the best outfits from Letizia. And definately the best hat she has ever had. Not something that shouts Letizia, but I love it! Love the hat, it looks stunning, and the rest of the ensemble is beautiful too. Love everything about it including the colour! Letizia ist superelegant und sehr schön - ich bin sprachlos, einfach wow.